Top Corner Balcony on Barrett Square! Barrett Loft, the premier Loft in town, is a top floor, corner unit affording you views like no other as you look down from the balcony as well as the Tower! There are 4 community pools to choose from (One is heated all winter) as well as the sugar white sands and emerald green waters only minutes away. In the Heart of Rosemary Beach on Barrett Square, this fabulous loft with a wraparound balcony overlooks the Town Center. Guests will enjoy the Rosemary Beach architecture and lifestyle from one of the highest views in the community. Check out the views of the Gulf before you head to the beach for the day! Enjoy stunning sunsets, gulf views or just good old fashioned people watching from the balcony. You can see all the activity in the town center as well as views for miles in both directions up and down 30-A. Don't miss the pools including the HEATED Sky pool all within a 3 minute walk from the building! See Chris at Sea Oats to reserve an umbrella and chairs on the beach, a short walk from the loft. Next to the entrance to the Loft building you'll find the courtyard with the Summer Kitchen/Blue by Night restaurant, the Sugar Shack, Carpenter's Market, and the Bamboo Bicycle Shop. For convenience, you can't get any closer! Just across the lane, you'll find the Vivo Salon Day Spa for that relaxing treatment you've been looking for. Inside the Barrett Loft, the living area provides a spacious entertaining environment with an 18 foot ceiling. The dining table seats 8 comfortably and the gourmet kitchen has additional bartop seating for 4. For the aspiring chef, you'll find stainless appliances and the convenience of a solid surface stove. A full complement of cooking utensils, pans, and knives will have you preparing and serving any meal you desire. With reclaimed pine flooring, this loft is distinctive as well as comfortable. Overstuffed down seating allows for lounging, reading, watching your favorite DVDs or just casual conversation. Escape up the spiral stair to the landing with seating for four and watch sunsets, action in the community or the building of the town center with a birdseye view. The master suite features a king size bed, tv/vcr with DVD, walk in closet, and a separate private balcony with gulf views. The master bath includes a large shower with built-in seating and an oversized jetted tub. The guest bedroom has a queen bed, tv/vcr with DVD and generous closet space. Kids will enjoy the bunkroom with its own TV/DVD player. The bunkroom has a pocket door the kids can pull closed to 'hide from the adults. 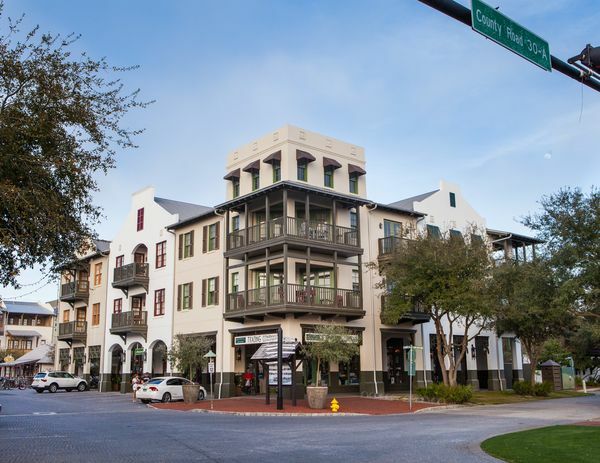 Rosemary Beach is a very friendly live,walk,shop community. The Barrett loft is a wonderful place to stay while visiting Rosemary you can be right in the heart of all the action or you can go inside and enjoy the quiet beautiful decor. Barrett has a great location on the third floor corner unit of the loft building up above the Trading Company. You will enjoy the wonderful kitchen fully stocked with anything you will need to cook and entertain your guest. Great balcony overlooking the heart of Rosemary. 4 pools in the Rosemary Beach community. One is indoor and heated year round. So happy to hear that you enjoyed the Barrett loft! We loved our stay - perfect for grandparents, adult children and their two young children. Great location close to dining, shops and beach. Great kitchen as well. Would go back on our next trip to Rosemary Beach! I'm so glad that you enjoyed the Barrett loft and it's wonderful location. We look forward to having you back on your next trip to Rosemary! I'm so glad that you enjoyed everything about the Barrett loft. I will have the dryer checked out, it's brand new so not sure why it wasn't working. My family and I stayed at this property last weekend. It was clean, spacious and the perfect location. We thoroughly enjoyed our stay! We are so glad that you found the Barrett loft a clean spacious place to stay while visiting the Beach! Our family of 4 stayed at the Barrett loft and loved our time. The living area and master bedroom/bathroom were spacious and clean. The best feature was the corner patio on the 3rd floor (above Rosemary Trading Company) that overlooked the center of Rosemary on 30A. Whether starting the day with coffee while the town was quiet or having a drink in early evening while there was more action, the patio was a nice compliment to the great indoor space. It was nice to have pool access to the four pools around Rosemary, if we wanted to take a break from the beach. The loft was excellent and could not have been a better location for enjoying all the things that Rosemary has to offer. We loved our stay and hope to come back soon! I am so glad that you all enjoyed the Barrett loft. The balcony is one of our favorite things too! We hope you will come back and stay with us again. Rosemary beach is amazing. This property was amazing. Great views on the balcony while we conversated with relatives. My kids loved the bunk bed room and the loft in the living room. Parking was easy and there are so many places to wander into. Food, shopping, ice cream. We will be back. I am so happy that you and your family enjoyed the Barrett loft. The balcony at Barrett is one of my favorite places to hang out when I'm there too!